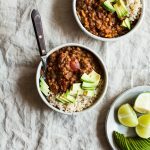 I’ve had my slow cooker for a few months now, and it has become an indispensable part of my kitchen. It’s a great tool for meal planning, because using it forces me to think ahead about what I’m making. It creates batches, which means plenty of leftovers to freeze for future busy weeks. And there’s nothing easier than being able to throw ingredients in, set it, and forget it. 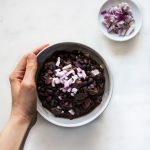 Until this week, I’d stuck mostly to soups and stews, and I hadn’t yet attempted a slow cooker breakfast recipe. 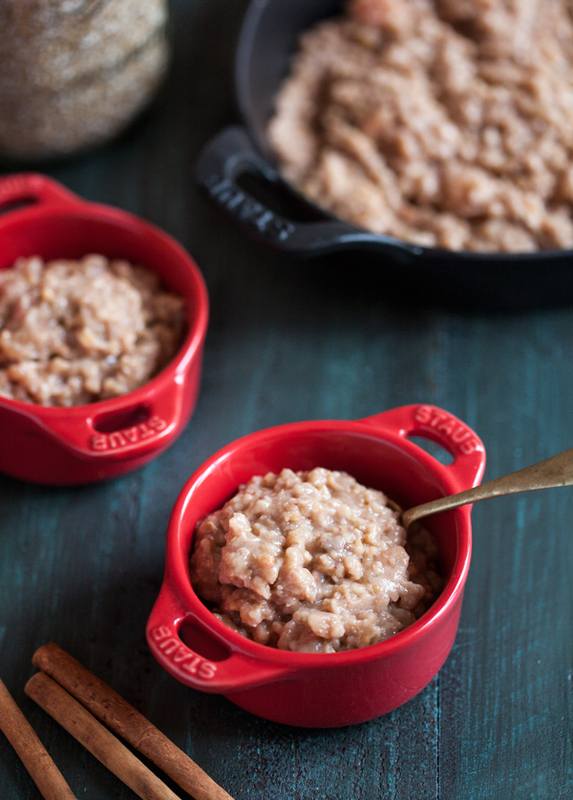 I can’t think of an simpler recipe to start with than these vegan slow cooker apple pie steel cut oats. 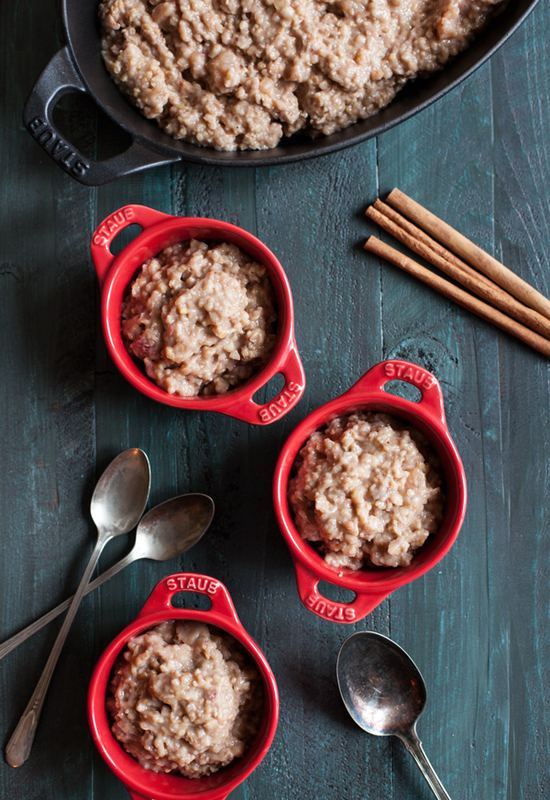 They make cooking steel cut oats easy, and while they’re at it, they’ll make your whole kitchen (in my case, whole apartment) smell like apple pie. And they’re a perfect recipe to wake up to on a holiday morning. When I was growing up, Christmas eve was a big affair. My mom and I spent it with my grandmother, who was the quintessential hostess. Her place was always full of friends, and she delighted in preparing lots of food, having gifts under the tree for every guest, and making us all feel welcome and celebrated. Christmas morning was a much more modest affair. My mom and I would wake up, enjoy some coffee, and eat something simple as we exchanged our gifts for each other. For me, It was usually oatmeal. This year, Steven and I will be enjoying a very quiet Christmas eve here at home, probably with a big pot of soup. Nothing fancy. 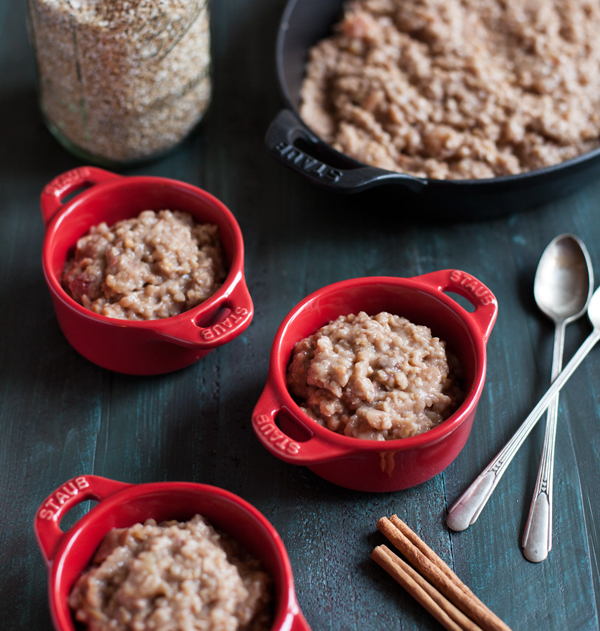 Tomorrow, we’ll head over to my mom’s in the morning, but not before I have a chance to cozy up with a bowl of these hearty, sweet apple pie steel cut oats. One of my favorite features of this recipe is the addition of chopped medjool dates. I was hoping they’d melt into the oats during cooking time, creating caramel-like sweetness without too much added sugar, and they did. I also added a bit of coconut sugar for extra sweetness and that same caramel/burn sugar flavor. You can add it, leave it out, or trade it for some maple syrup, which will also work nicely. If you don’t happen to have apples, try pears, and if you don’t have either, you can change the recipe around to be banana bread steel cut oats by adding three chopped bananas in place of the apples (that’s going to be my next slow cooker breakfast). Combine everything in a 4 or 6 quart slow cooker. 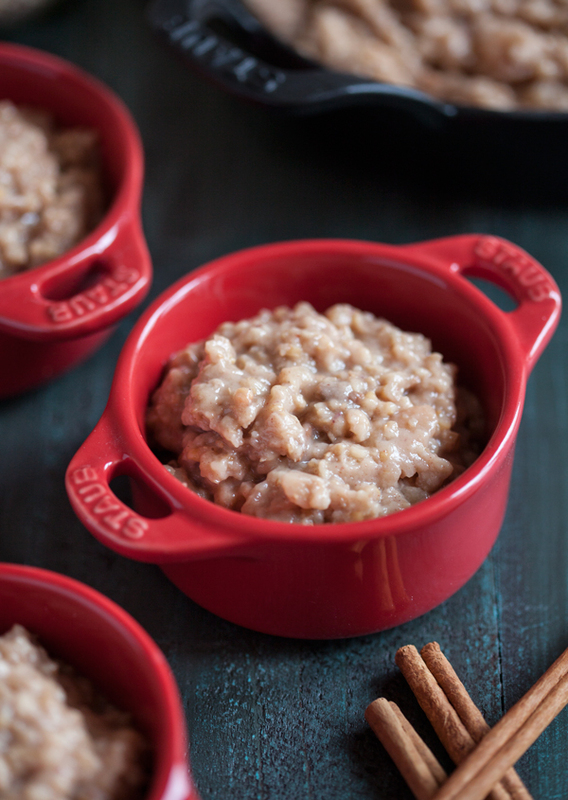 Cover the slow cooker and cook oats on low for 6-8 hours, or until oats are creamy and thick. If you want to make them thicker, you can cook for one additional hour with the top open. If you can, stir the oats once or twice during cooking (but it's OK if you can't). Serve oatmeal with toppings of choice. 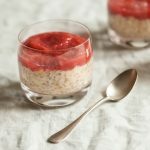 Leftover oats will keep in an airtight container in the fridge for up to five days, and they can be frozen for up to a month. If you don’t have a slow cooker, don’t worry. You can start by soaking the oats overnight in the almond milk and water combination. In the morning, add all remaining ingredients and cook over the stovetop. It’ll take a little longer, but you’ll have the same creamy results and wonderful fragrance. From my home to yours, I wish those of you who are celebrating Christmas a joyous, restful holiday. And I’ll be back this coming weekend with weekend reading as usual. Merry Christmas! 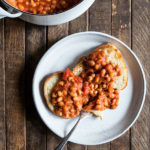 This looks wonderful, I may need to try it this weekend! Tomorrow we’re trying our first homemade vegan french toast – should be fun! This sounds delicious – anything with apples and I’m hooked! My slow cooker is definitely useful since I’m in college; it makes for easy dinners and, now, breakfasts!